Current clear heart and eye certs. Karma was my first show dog, and has been retired from the show ring. Karma arrived from Buffalo Kennels in Jan 06 and life hasn’t been the same since. A beautiful dog with a fabulous temperament, Karma has matured into a goofy sweet natured dog. She is a real water baby and together with Chilli, spends most of the summer in their pool. 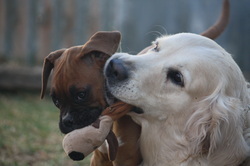 Karma gets along with all other dogs both large and small, she tolerates my kitten and puppies climbing all over her. She is a lovely dog in both looks and temperament and carries champion english and swedish bloodlines. Karma developed pyometra and had to be desexed in mid 2011.